When the words "clay" and "cartoon" are mentioned together, odds are that what springs to mind is Gumby, or, if you're a young whippersnapper, the delightful Wallace and Grommit. Gumby, the big green whatever-he-is, may be the most widely remembered clay cartoon figure, but he's far from the first. In fact, Gumby came fifty years too late. The Sculptor's Nightmare, released in 1908, seems to have the distinction of being at the forefront of that genre. Photographs of clay sculptures with a cartoon or caricature theme have popped up in newspapers on occasion. 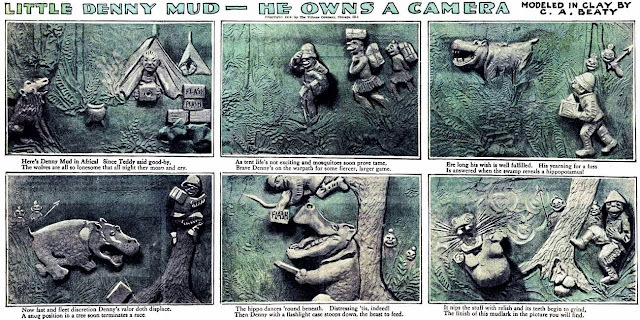 In the 1910s, Helena Dayton-Smith's clay creations often appeared in newspapers. Unfortunately, despite an extensive output she seemed steadfast in never producing any actual series of her creations; at least I've never found one that I could qualify for listing in my book. No, if we want a clay-modelled comic series, we must look to a fellow named C.A. Beaty, who created Little Denny Mud -- He Owns a Camera for the Chicago Tribune. The Tribune, generally a very conservative paper, was quite liberal in their openness to new ideas in the Sunday comics. For instance, they ran one of the most amazing experimental series of all time (in my humble opinion) with Crazy Quilt. 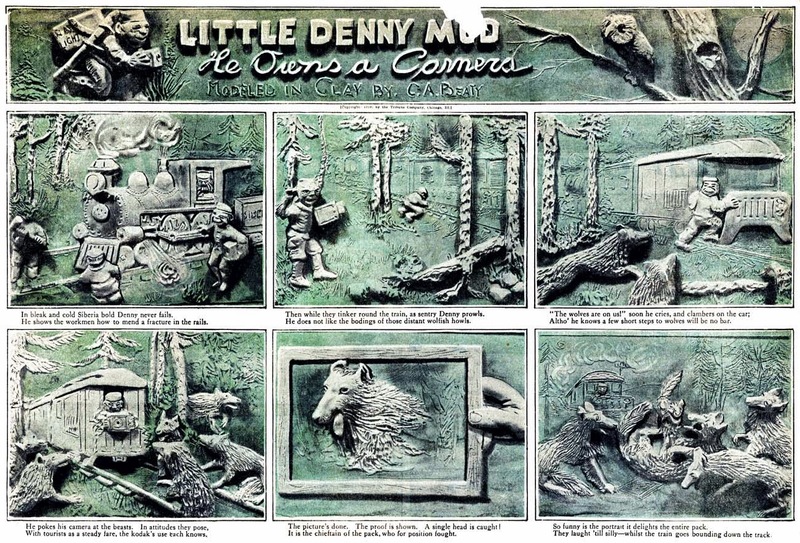 The experimental series Little Denny Mud, on the other hand, has to be considered a dud. Although the samples shown atop this post look reasonably good, you can thank Cole Johnson for providing us with really well-printed examples, and for your Stripper spending a lot of time in Photoshop to bring out as much detail in the samples as possible. In the Chicago Tribune the strip appeared dark and muddy. The mono coloring certainly didn't help any, but thankfully was mostly used on the backgrounds, so we could at least see the main action in the panels pretty well, at least when the colorist took pity on us. The other problem with Beaty's original brainchild is that even if the images were much clearer, the excruciatingly bad rhymes -- like fingernails on a blackboard -- would be enough to assign this series to the dustbin. I can't imagine that no one told Mr. Beaty that he would make the world a better place by sticking to prose. Little Denny Mud -- He Owns a Camera ran in the Chicago Tribune Sunday comics section from January 16 to May 8 1910.